$100,000 price reduction on this lovely used 87' Broward yacht for sale! 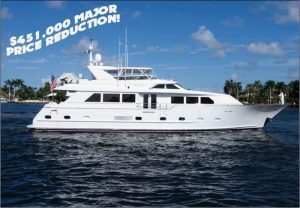 : Atlantic Yacht & Ship, Inc.
$100,000 price reduction on this used 87′ Broward yacht for sale! Chris Carroll brings news of a $100k price reduction on his beautiful used 87′ Broward yacht for sale! Known as “Dahvin,” this lovely used 87′ Broward is “turn-key” and ready to go. Her proud owner has invested over $500,000 withing the past year on upgrades and preventative maintenance. In brief, this included stripping the bottom all the way down to bare aluminum. Then six new coats of fresh paint were applied. Moreover, the port engine and the generator were rebuilt and new batteries and chargers were installed. Furthermore, new Garmin electronics and radar were installed. Together with all new audio-visual equipment, new 6-ton chiller, and the list goes on and on! This used 87′ Broward was custom built by Broward Marine in Fort Lauderdale. As can be seen, she features a casual yet elegant interior with bird’s eye maple throughout. As can be seen, the spacious saloon features comfortable seating with storage, new soft goods, game table, and bar. Forward, there is a dining area with seating for eight and custom case for china and stemware. The vessel accommodates six guests in three staterooms. For more information on this beautiful used 87′ Broward yacht for sale be sure to contact Chris Carroll today! HUGE price reduction on this beautiful used 87′ Broward yacht for sale! Check out this used 87′ Broward yacht for sale! This 87′ Palm Beach Boat Show Broward yacht for sale is a must-see!